Join Jeff Caliguire in discovering the secrets from the life of St. Paul that will help you turn your dreams into realities. - Publisher Readers will discover the secrets of a man who helped launch and enterprise that changed the history of the world. 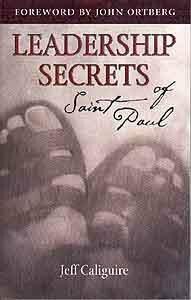 About "Leadership Secrets of Saint Paul"
Readers will discover the secrets of a man who helped launch and enterprise that changed the history of the world. Caliguire is the President of Soul Care Coaching and Consulting.